I noticed that DEFAULT.GIF inside MINECRAFT.JAR shows a number of BOX DRAWING characters from the character map. Is there any way to use these in game, or enable their use? I'd really like to use them. I'd like per-pixel drawing on signs or paintings instead. The arrows would be useful for direction signs instead of using ----> and <---- all the time, plus there's ones pointing up & down which isn't as easy to do on a sign. I've tried the usual tricks, holding the control key and typing letters & numbers, or holding the ALT key and typing on the keypad numbers that should correspond to the characters, but no dice. Someone with a twitter account should ask Notch. It's strange that they would bother to put the characters in the graphic file, but not let you type them in. I don't play multiplayer, do you know if there's a fix for single player? i've tried every combination of keys i could think of: nothing. THIS NO LONGER WORKS AS NBTEDIT DOESN'T SUPPORT THE NEW REGION SAVE FORMAT, AND NEVER WILL. Too bad, if you didn't color your signs before the update, there's no way to do it now. FURTHER INFO: NOW WORKS FROM MCEDIT, YOU CAN SELECT THE SIGN DIRECTLY AND EDIT CONTENT. Well, I found a way to do some of it, but it requires hacking with NBTedit. 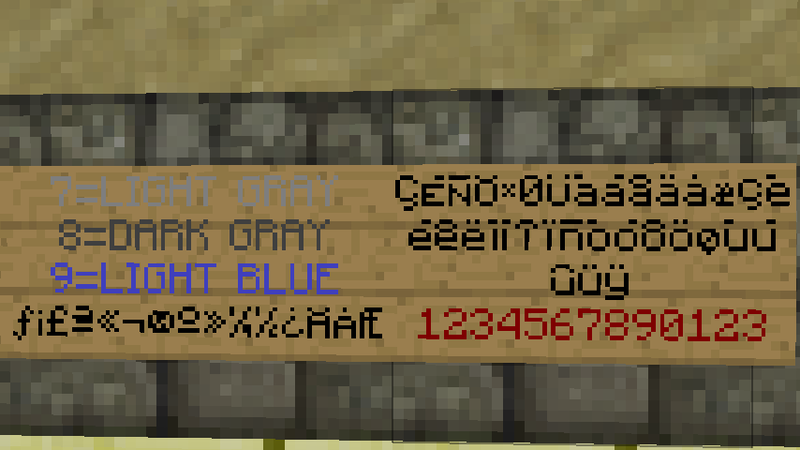 You have to find the chunk that the sign is in, you can use MCedit for this, just select the sign and hit zero (or is it 9?) to bring the file display up, then open that file in NBTedit and find the entity for the sign, the text can then be changed. I haven't tried a complete character set yet, I just had time to figure it out last night, but I did get some extended characters to display, and some fractions. If I get a chance, I'll post a tutorial and character set. The main thing I want to get working is the arrows so I can stop using ^^^^^ or ------->>>> for directions. OK, here's what I've come up with for the usable characters on signs. If you have an international or language specific keyboard setup, you should be able to type most of the accented characters directly, at least I could with an international English keyboard setup. I would imagine if you have your keyboard set up for a different language than English, the accented characters should appear automatically as you type the sign content in game. If you don't want to set up an international keyboard, you have to use NBTedit or another editor that allows you to directly edit the dat files for your save game. The easiest way to find out the chunk dat file you need to open is to get the Chunk Coordinate Display Mod once installed, go in the game and hit F3 to bring up all sorts of information. Walk to the sign you want change. Look at the last line in the displayed data and it will tell you where in your save game folders the dat file is. Now run NBTedit and open the dat file for the chunk that contains the sign you want to edit. You'll have to find the sign in the entity list, so start expanding entries until you find the sign you're looking for, it should be pretty obvious. You can then edit each line for the sign directly. You can type in the extended characters you want by using the ALT key in combination with numbers entered on the numeric keypad. This is for XP only, I don't know how other operating systems let you type in extended characters, you'll have to figure that out yourself. You have to use NBTedit as Minecraft doesn't directly recognize the ALT+0### key combination. To type in the character ö, hold ALT and use the numeric pad (not the numbers on the main keyboard) and add a zero in front of the number, so you would type 0246 while holding the ALT key. Once you are done typing the numbers, let go of the ALT key and the character will appear. Hit enter to close the edit box in NBTedit and save the file, run Minecraft and look at your new sign. If you glanced at the list, you'll note that I have colors listed there. Took me a bit to figure this one out, as I kept crashing minecraft for some reason. The ALT+0167 character, which is normally § does not appear on the sign, but when followed by a space or single digit number, changes the color of the text on the sign, see pics below. The § character and the number count as part of the 15 character limit for text on each line of the sign, so using a lot of colors in one line will eat up the amount of letters you can type. Unfortunately, I found no way to type in the other characters that are in the default font. 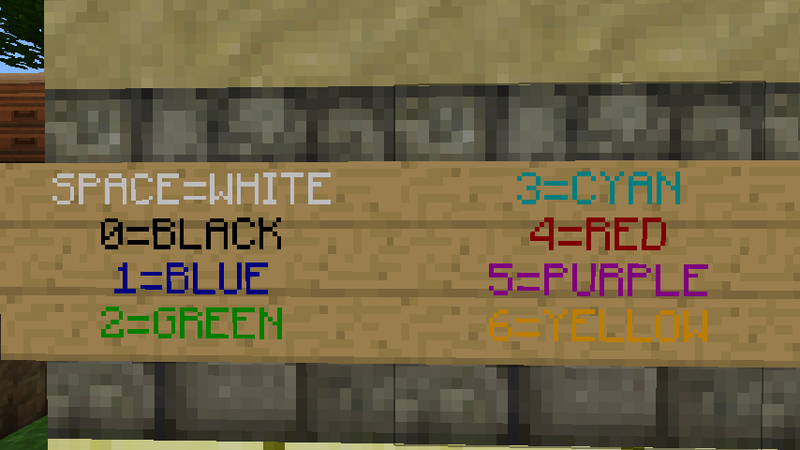 Well, I know how to type them in, but Minecraft doesn't display them, so, until Notch fixes it or a mod does, we won't be able to use the more useful characters in the font like the arrows and lines. any way to get one? maybe a program or something? Not sure how you'd handle it on a laptop, isn't there a function key usually that lets you change the normal keyboard layout to allow number pad entry? Something like that. Or, if you're on windows, you can use character map and copy & paste which is a pain, but gets it done. This should map CTRL+# where # is a number on the main keyboard to the proper numpad number. If you don't like having to hold down CTRL, remove the '^' characters so that the main keyboard numbers are mapped without any modifiers to the numpad numbers.